I am kicking off the New Year by reviewing new artists I encountered in the past 12 months and pulling out my Gold Stars. So here, dear readers, are SIX ARTISTS who felt like a breath of fresh air in 2013. To show you that art collecting is an affordable luxury, I am focusing my picks in the $1,000 to $10,000 price range. My own mantra for creating a fabulous home is: 1.) maximize the connection to nature 2.) stick to elegant, comfortable furnishings, and 3.) splurge on ART. But, which can better capture your unique personality, a couch or an original piece of art? 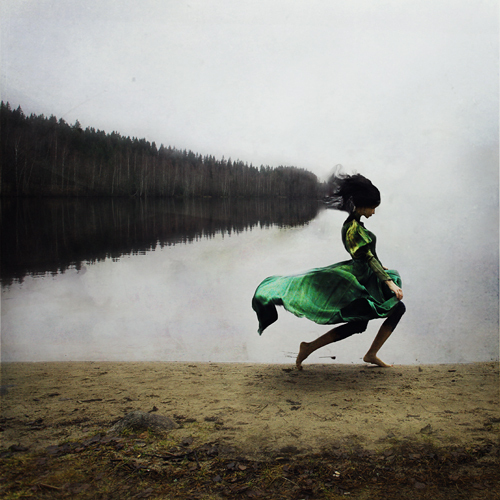 I discovered the stunning work of Kylli Sparre after she won the International Fine Art Photography Competition and it was love at first sight. Kylli studied ballet for years in her native Estonia before realizing she wanted to create theatrical scenes instead of star in them. Her work noticeably contains the elegance of ballet. I am drawn to the way Kylli’s portrays both romance and danger in her dramatic narratives. Her experimental photography contains so much action they feel a bit like short films. With titles like “Dancing With the Fairies,” she cleverly seals the storyline. Most of Kylli’s C-prints are available from this gallery in Amsterdam, in small editions, for roughly $1,000. I consider these works to be a steal and expect prices to increase as more art lovers discover this prima ballerina. Erick Madigan Heck has been hot stuff in the fashion world for a while, but I stumbled on his vibrant photographs only recently. While the high gloss of his fashion aesthetic first caught my eye, my mind wasn’t quite sure what I was looking at. Erick’s fusion of fashion, painting and classical portraiture results in a bold artistic vision with loads of charisma. As someone who resists labels, I appreciate artists who skillfully blur lines and push boundaries. Erik keeps his methods to himself (who can blame him, copycats are a menace), but I imagine the post-production process is elaborate. Given that Erick is the winner of several prestigious awards and the youngest photographer to shoot the legendary Neiman Marcus "Art of Fashion" campaign, I’d say his vision is strongly resonating. Erick’s fine art prints, full of wall power, are available in very small editions from his studio here. While I am a fan of abstraction, I am not afraid to admit that abstract artworks too often leave me cold. Because abstraction is rooted in feeling more than narrative, it can be challenging finding a way into the work. The visual language of color, line and form speak to me through my emotions, not my fantastically active mind. Amy Feldman’s large-scale canvases, some 8-feet high, simply FEEL good to me. They feel sculptural, and playful, and feminine. I like their rhythm, their authority, and their lightness. In a rather serious art world, Amy’s looseness feels like a taunt, or maybe just an invitation to let your hair down. Whatever the reason, art fair crowds and collectors are digging her vibe and Amy’s impressive resume keeps accumulating Gold Stars. Brooklyn based Amy is represented in NYC by the Blackston Gallery. Sometimes all I need is a blast of bold color to make me feel joy, add in layers of texture and I am doing cartwheels (in my mind.) Jason Rohlf delivers with his graphic and beautifully textured collages, some made with shop rags. Using both drawing and collage techniques, Jason explores surface and color by making and remaking each piece until the story is complete. His process is part mechanical, part intuitive and I like the resulting juxtaposition of the planned vs. the chaotic. Many of his works are on the small size yet radiate a blast of life force. His “Shoprags” series is a crowd favorite, and I am particularly drawn to his works that feature my favorite shape – the circle. Is there a culture on earth that doesn’t worship the circle? No beginning, no end, just an organic flow. 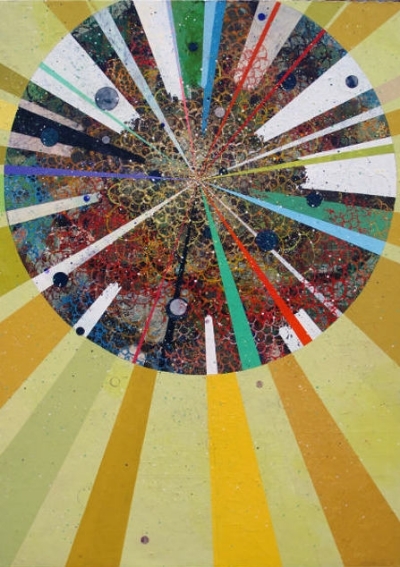 Brooklyn based Jason is represented by the Troy Folliard Gallery in his native Milwaukee. Creating an art filled home is not unlike composing a musical score - beware of one-note melodies or too much staccato. Visually intense works crave the balance of softer ones, and complex narratives need simples ones to heighten the drama. Art can excite or calm the senses and every collector composes according to their rhythm. Bryan Nash Gill’s wood block prints anchor me into my true nature. Celebrated worldwide for his beautiful and raw installations and sculptures, Bryan’s prints gracefully bring the outdoors inside. Inspired by a local tree mill, Bryan pays homage to sacrificed trees by documenting each detail of their wood grain onto paper through relief printing and a laborious rubbing technique. For me, the boldness of the works comes from their simplicity and honesty. Sadly, Bryan unexpected passed away last spring and I am thankful to him for sharing his talents so generously. A limited selection of prints are available at the divine Ashes and Milk and this gorgeous coffee table book documents Bryan vision. Those who know me, or my work, recognize that I am equal parts earth and sky. Sometimes I need terra firma to ground me sometimes I need big skies to let me fly. 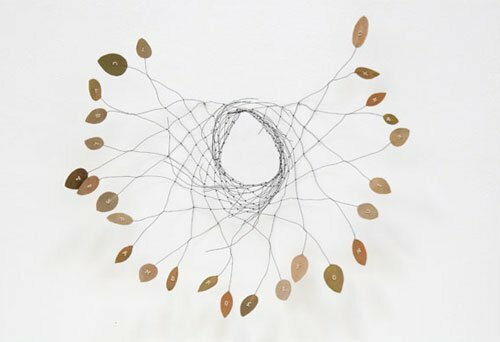 The delicate, ephemeral works of Mari Andrews are both airy and intelligent. They speak to a natural order of things and the power of the unseen. Mari calls her works “paperless drawings,” which feels right to me. An obsessive collector of objects, from nature and the man-made, Mari’s drawings bring attention to things that usually go unnoticed. For me, the brilliance of her work is how disparate elements collaborate with each other to create organic beauty. Her work seems to mirror both human frailty and the intelligence of collaboration. You can discover more of Mari’s world in her studio. I hope you enjoyed my Gold Stars and discover ART that compels you to splurge in 2014. As Picasso said - Art washes away from the soul the dust of everyday life. I look forward to traveling the globe to discover new artists in the year ahead. Like what you see? Get on the list.